Built in the late 1930s, Timberline Lodge is a mountain lodge on the south side of Mount Hood in Oregon. Skiers travelled from Government Camp to Timberline Lodge on the the sky-riding bus highway. 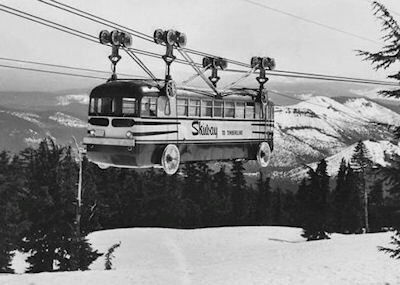 The sky bus was powered by two 185 horsepower engines taking passengers from 3,800 feet all the way up to 6,000 feet, completing the more than 3 mile journey above tree level in less than 10 minutes supported by 38 steel towers up to 72 feet tall.